Spacious 3 rooms in a modernized George Zunner circa 1927-1928 building on the southeast corner of Buckingham& Wadsworth Streets in South Downtown Hartford, CT 06106. The windows view of Downtown Hartford, Bushnell Auditorium across the street(Capitol Avenue) provide a historical perspective yet 2 blocks from many walk-able amenities- numerous restaurants and eateries from the inexpensive to the gourmet. Original gleaming hardwood floors, original deep porcelain tub with shower, large eat in kitchen with pantry fully furnished with 18' cubic refrigerator/freezer, gas stove for doing your own cooking & all the essentials with ample storage, basement laundry if needed, superintendent on premises with office across the hall, new queen size bed with living room futon and 44" flat screen tv with cable&internet; free parking; thermopane windows & screens; good security with nonduplicable security door key. gas hot water heat steam with radiators in each room-central. This place was good overall. Had an issue with the oven that filled the apartment up with smoke when I tried to use it because it hadn’t been cleaned. Tried to contact the office when this happened to get cleaning supplies, several times and the door was open but no one was there. Communication was spotty even when checking out, but in the end I had everything I needed. Marc was a great host, providing lots of good dining and other suggestions. 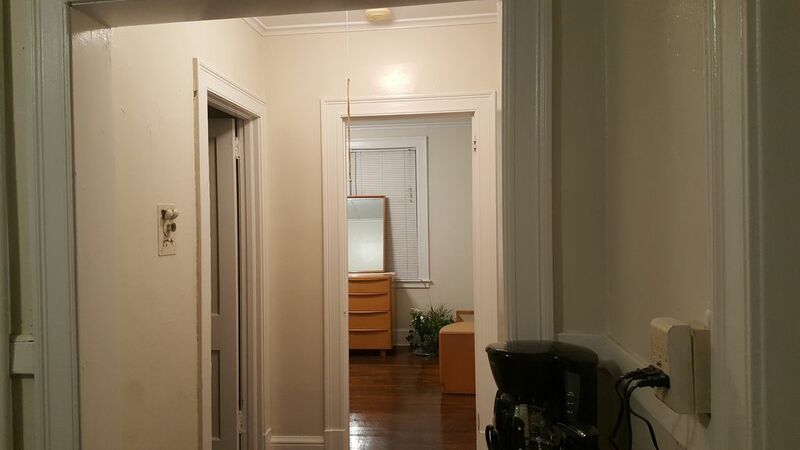 His large 1 bedroom is homey, with a comfortable bed, large living room and kitchen and is located just a short walk from the Bushnell event venue and park, state capital and lots of good restaurants. Having cereal, coffee and cream there for the mornings also got me off to a good start every day of my stay in Hartford. we are located in south Downtown historic Hartford. The oldest house in Hartford is on Main Street 2 blocks away and the first public museum in America is 4 blocks away. The Mark Twain House and the Harriet Beecher Stowe House are nearby. We are two blocks south of the Bushnell Park and one block southeast of the Bushnell Auditorium. Our location in SODO is within a mile of all Downtown facilities and venues and many dozens of restaurants, pubs and fine dining as well as the CT Convention Center. We are located a mile south of the intersection of Interstate of Highways 1-91 & I-84 surrounded by state offices, turn of the century brownstones and older renovated eclectic brick buildings.